Miami, FL, October 10, 2017 --(PR.com)-- Qrons Inc. (OTCPK: QRON) ("Qrons " or the "Company"), a preclinical biotechnology company developing advanced cell-based solutions to combat neuronal injuries with a laser focus on traumatic brain injuries, announced today the launch of its fully featured website. The website offers quick and easy access to essential information by offering a comprehensive understanding of the Company's innovative multi-disciplinary approach to addressing the unmet medical need of treating traumatic brain injuries. The site also gives users, including investors, quick access to essential information. A complete investor section features current news, events, financial and stock information, SEC filings and corporate governance information, is updated in real-time. 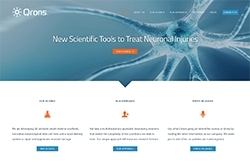 The website has a clean uncluttered design, excellent functionality and enhanced rich content that is focused on the Company's mission to find solutions to combat traumatic brain injuries. Created with the user-experience firmly in mind, the website has been designed using the latest technology to be compatible with today's browsers and mobile devices. The new website went live on October 10, 2017. Traumatic brain injury (TBI) is the number one cause of death among young adults. In the U.S., there are more than two million brain injuries each year, and approximately 50,000 people die from these injuries. The medical costs of TBI exceed $76 million annually," added Mr. Meer. Qrons expects its new website to be updated regularly with news of scientific advancements, business activity, corporate milestones, events, investor and financial information. Visitors are encouraged to explore the website and sign up for Company email notifications. Headquartered in Miami, Florida, Qrons Inc. (the “Company") is a publicly traded preclinical-stage biotechnology company developing advanced cell-based solutions to combat neuronal injuries with a laser focus on traumatic brain injuries. The technology could potentially treat a wide range of neurodegenerative diseases. The Company’s treatment integrates proprietary, engineered mesenchymal stem cells 3D printable scaffolding, smart materials and a novel delivery system. The Company entered into a license and research funding agreement ("License Agreement") with Ariel University R&D Co., Ltd., a wholly owned subsidiary of Ariel University of Samaria, based in Ariel, Israel. In consideration for payments under the License Agreement, the Company received an exclusive worldwide royalty-bearing license in Ariel patents and know-how to develop and commercialize products for neuronal tissue regeneration and/or repair, resulting from Ariel's research or technology or the Company's research funding. The Company is also conducting a research study with Professor Chenfeng Ke of the Chemistry Department at Dartmouth College aiming to develop innovative 3D printable, biocompatible advanced materials and stem cell delivery techniques to treat TBI. For more information, please visit our website at qrons.com. This press release contains forward-looking statements made pursuant to the safe harbor provisions of the Private Securities Litigation Reform Act of 1995, including statements concerning our future product development plans, other statements regarding future research, and any other statements which are other than statements of historical fact. These statements involve risks, uncertainties and assumptions that could cause the Company's actual operations, results and experience to differ materially from anticipated results and expectations expressed in these forward-looking statements. The Company has in some cases identified forward-looking statements by using words such as "anticipates," "believes," "hopes," "estimates," "looks," "expects," "plans," "intends," "goal," "potential," "may," "suggest," and similar expressions. Among other factors that could cause actual results to differ materially from those expressed in forward-looking statements are the Company's need for, and the availability of, substantial capital in the future to fund its operations and research and development; successful development of clinical studies for any product we may develop, U.S. Food and Drug Administration clearance for any products developed, manufacturing of a commercially-viable version of our system and demonstration of safety and effectiveness sufficient to generate commercial orders by customers for any product we may develop. A more complete description of these risk factors is included in the Company's filings with the Securities and Exchange Commission. You should not place undue reliance on any forward-looking statements. The Company undertakes no obligation to release publicly the results of any revisions to any such forward-looking statements that may be made to reflect events or circumstances after the date of this press release or to reflect the occurrence of unanticipated events, except as required by applicable law or regulation. Click here to view the list of recent Press Releases from Qrons Inc.